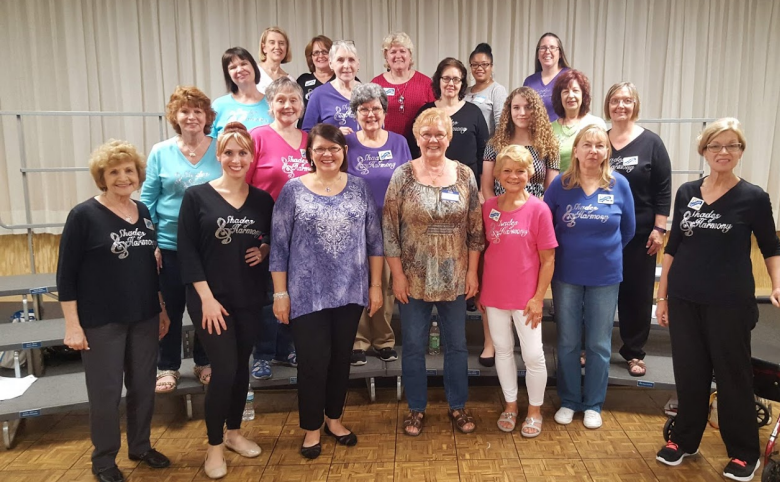 Shades of Harmony is a women's a capella chorus whose members share a love for singing and performing, while committing to improving their vocal skills through personal responsibility and education. "Shades" was started in 2001, right after 9/11. We needed something fun to lift our spirits after the terrible tragedy. The group quickly grew, started performing in the area, and chartered with Sweet Adelines in 2005. We went to our first competition in the spring of 2006 and have enjoyed the opportunity of being evaluated each year as we strive to improve our singing and performing skills. At present we have members of all ages, from teen to "senior citizen." Performing is what our hobby is all about and we have sung for many audiences including festivals and Christmas tree lightings, Haddonfield First Fridays, retirement communities, libraries and much more! Our doors are open to all - if you want to come to listen or if you think you might enjoy singing our style of music. Please join us any Tuesday! Interested in becoming a member? Check out the Prospective Member Guide! Today the membership of nearly 25,000 women, all singing in English, includes choruses in most of the fifty United States as well as in Australia, Canada, England, Finland, Germany, Ireland, Japan, New Zealand, Scotland, Sweden, Wales and the Netherlands. The organization encompasses more than 1,200 registered quartets and 600 choruses.